With this recipe kids can have fun helping and even eat the unbaked dough. I really don’t like rolling out cookies and I created this cookie recipe so I could have stars without using a cookie cutter. In medium bowl stir together butter and corn syrup. Stir in sugar and vanilla. Add salt and soda to flour. Stir flour mixture into butter mixture until blended. Preheat oven to 325F (160C) degrees. Form dough into tiny balls, using one level teaspoon of dough for each. There should be about 48 balls. Place balls two inches apart on ungreased baking sheets. With bottom of glass flatten balls to 1/8-inch thickness. To prevent dough from sticking to bottom of glass, dip bottom of glass in sugar as needed. Bake 6 to 8 minutes. Immediately cut half of the cookies into six pie shaped wedges. Loosen cookies from cookie sheet. When cool enough to handle, frost the uncut cookies with chocolate. 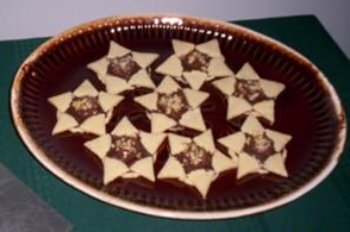 Arrange tiny wedges of cookie over chocolate to form a star. (From each cut cookie there will be one extra wedge for the kids to eat or to crush and sprinkle over the hazelnut spread instead of the hazelnuts or walnuts. Place one teaspoon of hazelnut spread in center of each cookie. Sprinkle with nuts or crumbs. Chill cookies until set. Makes 24 star cookies.